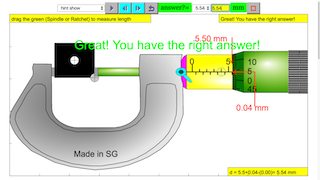 Play with the Micrometer Model. Test what you've learned by trying the input field. (g) describe how to measure a variety of lengths with appropriate accuracy by means of tapes, rules, micrometers and calipers, using a vernier scale as necessary.